When will be Arresting Behavior next episode air date? Is Arresting Behavior renewed or cancelled? Where to countdown Arresting Behavior air dates? Is Arresting Behavior worth watching? Arresting Behavior was the Reno 911 of 1992 network television (Reno 911 currently airs on Comedy Central). Both shows are scripted comedies that are spoofs of such “reality” shows like “COPS”. 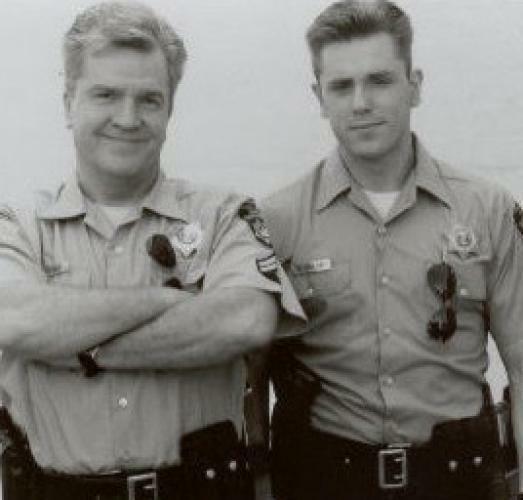 Officer Bill Ruskin (Leo Burmester) and Officer Donny Walsh (Ron Eldred) are cops in Vista Valley California. As they attempt to perform their job in the streets of Vista Valley, hand-held cameras follow them around. There are some serious crime that occurs in Vista Valley, but Ruskin and Walsh seem to only notice things the smaller petty crimes. Connie Ruskin (Lee Garlington) is Bill’s wife, and a professional dog groomer, while Rhonda (Amy Hathaway), Seth Ruskin (Joey Simmrin), and Bill jr (Eric Balfour) are Bill’s kids. Chris Mulkey also stars, as Officer Pet Walsh, Donny’s brother. Series lasted for a couple of months in 1992 (August-September) on ABC (always 9:30-10pm EST, though sometimes on Tuesdays, sometimes on Wednesdays). EpisoDate.com is your TV show guide to Countdown Arresting Behavior Episode Air Dates and to stay in touch with Arresting Behavior next episode Air Date and your others favorite TV Shows. Add the shows you like to a "Watchlist" and let the site take it from there.